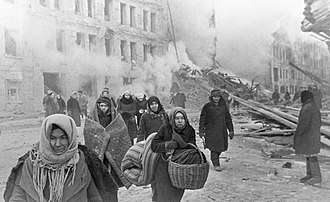 While I’m on the subject of St. Leninsburg it is fitting to note that today marks the end of the brutal 872-day Nazi siege of what was then Leningrad between 8 September 1941 and January 27, 1944. Whatever one thinks of the regime and the name, it was an astonishing demonstration of tenacity under circumstances that literally defy belief. It cost an estimated 580,000 German and three and a half million Soviet military casualties and a million civilians, over 600,000 during the siege and an astounding 400,000 in the evacuation (which gives you some idea of the efficiency and compassion of Bolshevism). The inhabitants were menaced, obviously, not only with death by bombardment or bombing but also and primarily by starvation. Among the siege tales of horror were several thousand arrests for cannibalism, mostly of those already dead of natural causes although more than 10% involved deliberate killing of humans for food, and literally thousands of cases of murdering people for their ration cards. Not that there was much to be had even with a card; during the siege people ate their pets, often touchingly trading with a neighbour so as not to eat their own. There are even statues to two hero cats from the siege, Elisey and Vasilisa, though they turn out to be celebrated not for being food but for what they ate, being part of a shipment of cats delivered from Yaroslavl to help deal with the overwhelming plague of rats in the shattered city. Such heroism deserved a better cause than Stalinism, even in opposition to Naziism. But it is heroism all the same. And while I wish it had never been necessary, I do recognize and am inspired by their capacity to persevere through conditions unbelievable even to hear about, let alone endure.